In Japan, Sony is offering some the digital download version of PlayStation Vita titles at a lower cost. Still being months away from the February 22nd launch in the west, there haven’t been any similar plans outlined for markets outside of Japan. But a new survey that Sony is sending around to PlayStation Network users may shed some light on the situation. In the survey, Sony is pitching a variety of pricing models for PlayStation Vita retail games, as well as a lower-cost digital download counterpart to be made available in the PlayStation Store. In this first image, Sony is asking users to weigh in if they’d prefer a lower-cost digital version, or pay the full price and receive some type of incentive – a PSN $ credit in your wallet. 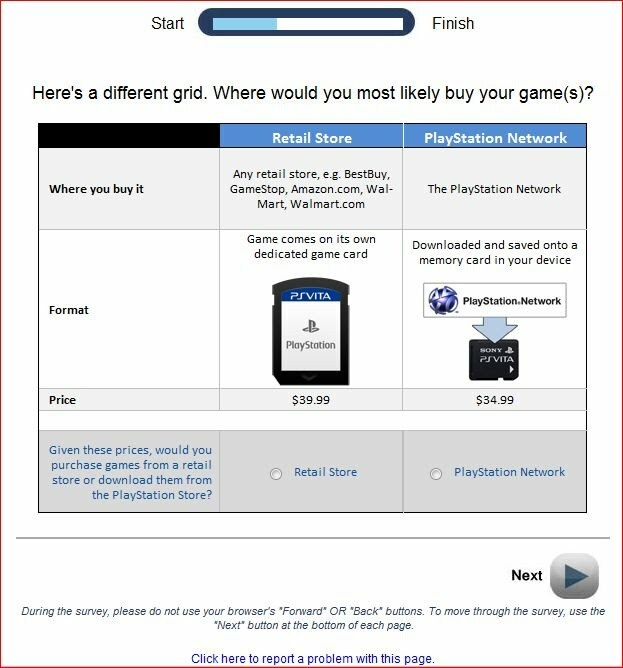 Next, users were asked to compare different pricing models – some have the downloadable version being less than retail (pictured below), while others offered the PSN credit plus free access to future DLC, or best of all significant–as low as $14.99 for Vita games–discounts for PlayStation Plus subscribers. The survey continued on the same path, asking questions about pricing of Vita games. While this isn’t a confirmation that such discounts will be applied to PlayStation Vita titles, it does appear that Sony is at least considering such a pricing model. If Sony does go forward with such a program, which would you choose? And would a discount get you to buy digital over retail? Let us know in the comments or sound off in our forums.